Funding a farm? Don’t forget about grants! We’ve said it before, and we’ll say it again: getting funds is one of the trickier parts of farm startup. Many farmers get hung up on funding because they either don’t know how much money they need or they don’t know what options they have. Solving this problem requires that farmers have an accurate financial plan in place and that they explore options like the 15 opportunities listed in this guide. You might already be aware of funding options like using investors, capital funds, or personal resources. One option that farmers frequently forget is grants. Grants are usually a one-time donation of money connected with a certain cause or purpose. Since nationwide interest in local agriculture has increased, grants have as well. Today, gathering funding can start with writing a few grant proposals to many of the generous donors hoping to back a great cause. How does grant writing work? How exactly does one get a grant? Grants are facilitated by a company or organization that puts out a notice. The notice typically includes information about the qualifications as to who is eligible for the money. Many sites and communicators categorize grants by the qualifications (see the table here as an example). Once growers find the best grant for them, they begin an application process, generally involving a formal declaration of application and intent. This means submitting a few forms via email or website. This step is where the most of your writing will take place. See below for some tips on grant writing! After the applications have been submitted, the potential candidates for the grant are evaluated by a committee or panel judging the merit of each application. Depending on the number of applicants, this process can be quick or it can take some time. When the top candidates are chosen, they will be notified of the award. Finally, the awardees must begin the process of actually receiving the funding or support that the grant promises. Again, a little paperwork will be necessary to ensure the funds are transferred cleanly and legally. *Note: Many, many grants go unawarded each year. These organizations are actively looking to give out money, but a lot of the time they don’t find people. This means that there is money out there waiting for the right person to come along and use it! In some cases, that person will be you. A successful grant is rarely written, edited, and reviewed by a single person. Instead, most are a successful endeavor by a small group of people in a business or educational environment. Don’t be afraid to ask for help! When you find a grant that you think might fit your farm, you’ll follow the instructions that come with it to apply. A lot of the time this will mean turning in a written form or letter of some kind. Clearly writing out the purpose for grant funding will keep you focused and make your grant journey more efficient. This means defining the primary physical goal you’re trying to accomplish and why you’re trying to accomplish it. Establish the bottom line for your funding needs as close to an exact dollar amount as you can, giving yourself a little extra breathing room in case of emergencies. Later on, you will repeat these goals to those evaluating your grant. Delivering specifics from the get-go will make your grant that much more appealing to those evaluators. Great writing comes from great reading. The more time you spend reading technical documents like grants, the better you will be at writing them. Be sure to review examples of other successful grants before starting your own. Good grant authors borrow. Look for folks who are writing grants for similar situations as yours. Ask around your local growing community for successful grant writing stories. If you’re in the educational field, ask your administration for any similar projects that have been greenlighted that might have connections to successful grant appeals. When you find someone who has been successful, ask them for a copy of their grant. Pick out the themes that could be responsible for that success and use them in yours. 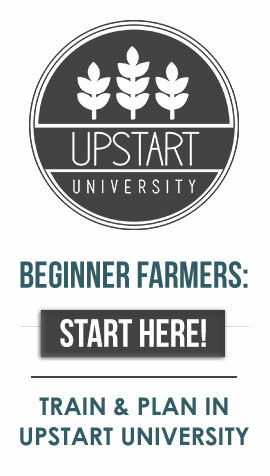 Finally, visit community sites like Upstart University’s growing social media community and ask around for examples that you can use to jump-start your grant. Read tips from grant recipient Pulaski Grow Farm here. Once you’ve established some of your basic financial goals and found examples of successful grants similar to what you have in mind, you’ll need to begin to find grants that match your needs. Those companies, organizations, and individuals that choose to award grants are typically looking to endorse those with similar goals, outlooks, and opinions on matters important to each individual group. Try to find grants with which you can make a strong case for having a lot of common goals. Federal or State School Grants: These grants are focused on improving nutrition, student health, and educational opportunities nation- or state-wide. Examples include Farm to School and Team Nutrition. Agricultural Initiatives: These grants focus on improving the state of agriculture, empowering local farmers, or improving crop research. For example, the Specialty Crop Grant focuses on improving specific crops, and experimenting with hydroponic viability falls under that category. Big Box, Commercial, and Private Grants: “Big-Box” stores are stores like Lowes, Home Depot, Shopko and Walmart. These stores and many more have foundations established providing grants and other opportunities for people to better their communities—commonly through school programs. And don’t dismiss the possibility that local donors or other private grant awards might exist in your city, state, or region. Once again, your local community will be the best resource for information on these private sources. Another useful strategy when choosing grants to pursue is to request more information, detail, or requirements from the organization providing the grants. Don’t be afraid to send an email or quick phone call to an organization offering a great grant opportunity. Asking questions will not only make your proposal stronger but hopefully impress the organization with your dedication to success. Once you’ve found a grant that is a great match for your needs, you’ll need to seriously begin thinking about how this grant will aid your proposed budget. Those evaluating the various grant applications will be closely examining where their money will go and how it will be used on the farm. You’ll want an airtight budget proposal with every item explained and accounted for. Don’t forget to account for the small details of funding your farming project like utilities, backup parts, and seeds, as details will demonstrate competence and reliability to the grant evaluators. For those potential farmers who lack confidence behind a keyboard, this can seem like a daunting task. But have no fear! Most grants will have a specific writing guideline to accompany the grant request, including a bulleted list of items to address. Be sure to stick closely to the guidelines provided. Grant writing, like farming, is a straightforward process perfected daily by hundreds of people. Take your grant writing one step at a time, and success will come. Going back to our second tip, this is also an opportunity to put to use similar grants. Look at the formatting, goals, and word choice of these similar grant appeals and detail out all the elements you find particularly engaging or successful. Keep your language plain and straightforward, not flowery. Fancy language and extended metaphors can make your grant proposal look tacky or desperate. Professional writing is the name of the game. If you’re still struggling, consider outsourcing the grant writing itself to a more capable colleague, friend, or family member skilled at writing. If you’re lucky, they might even already have grant writing experience! There’s nothing wrong with choosing a person more qualified for the job. If all else fails you, here’s a basic format for a grant proposal, paragraph by paragraph. Introduction: This paragraph should preview the big picture surrounding your project. Think of this like an “elevator” pitch, where you give a lot of information in a short period. You’re trying to explain the whole scope of your planned concept to someone who may have no idea of your goals. Keep it simple. Background/Need: In this section, explain the context of the grant. Describe the reasons for and history of the project. Include language about how the project will help your community, improve farming techniques, and other specific needs. Goals and Objectives: What’s your endgame? Explore what you’ll do after you get the funding, and how this will be a positive thing. Remember that farms will be operating in terms of years, so consider what your growing operation will be like in 1, 5 and 10 years respectively. Qualifications and Resources: What tools and talent do you possess that will ensure that the grant award will be implemented successfully? This section is to ensure those evaluating the grant application that you are capable. You’re looking to demonstrate your competence. Conclusion: Restate all your major points (the above paragraphs) in brief, and be sure to thank the organization awarding the grant for their time and the opportunity. Your grant proposal, once written, should undergo a major editing revision. If you were the author, be sure to have a capable friend or colleague review your proposal. Be sure to address all the common editing challenges such as spelling, punctuation, and grammar. However, just as important is matching the language of the grant. So if you’re writing your grant to build a, for example, indoor garden in a classroom and applying for funding from Farm to School, be sure to illustrate, as much as possible, that your indoor garden will provide food to local students. Go on at length about the opportunities to feed students with local produce grown from your own garden. The fact that you might intend for the garden to focus more on educational opportunities rather than produce is irrelevant, as long as you can plan to deliver upon your promises to Farm to School. Matching the language of the grant will let those evaluators know that you’ve given careful thought to your appeal for funds, and will make them feel at comfortable and at home with your proposal. Matching the language of the proposal is the same as using a company’s business language and culture in a job interview: you’re not trying to copy or mimic their success, just demonstrate that you pay attention and know their needs. Be sure that you aren’t limiting yourself to just a few grants. To extend the job interview metaphor, you aren’t going to find your dream job the first go-around. Be ready for a little failure and disappointment before you hit the jackpot. The more grants to which you apply, the more likely you’ll be accepted. Even more, each grant you write is practice for those down the line. Next thing you know, you’ll be a pro grant writer, and those sweet funding dollars will be rolling in to jump-start your growing operation! Maybe you’re not set on grants and still want to consider options like a loan, crowdfunding, etc. If that’s you then check out the 20 Minute Guide to Funding Your Farm, a quick read to introduce you to the top fifteen different funding options that small farmers are using. this website. Will read and know how to apply and help a group of women and youth raise chicken and bees. There are lots of ways to get funding via loans and grants. I suggest starting with the USDA Farm Service Agency Farm Loan Programs webpage.